Today the Jewish Leadership Council, Board of Deputies and party-affiliated Jewish Labour Movement slammed Labour’s new antisemitism guidelines. After months of controversy over the way complaints about antisemitism are dealt with by Labour, the party’s ruling body created a new code of conduct to clarify its definition of antisemitism. 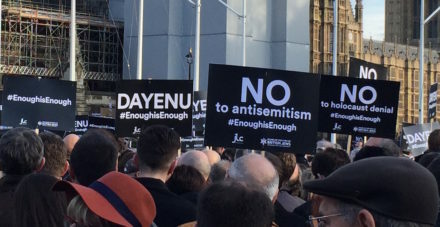 The document – passed unanimously by Labour’s national executive committee on Tuesday – adopts the working definition of antisemitism set out by the International Holocaust Remembrance Alliance (IHRA), but does not include the organisation’s full list of behaviours identified as antisemitic. But a Labour Party spokesperson said all the examples listed by the IHRA are in fact included in the body of the guidelines document. The party is keen to emphasise that the new code of conduct covers the same ground as the IHRA examples, but adds detail so that the document is more useful and can serve also as a tool for political education. Sources pointed out that there are examples of antisemitism in Labour’s document that are not presented by the IHRA, including “the making of unjustified reference to… being Jewish”. In a statement released today, JLC chair Jonathan Goldstein and BoD president Marie van der Zyl said antisemitism was “for Jews to determine” and it was “impossible to understand” why the party had decided not to adopt the full IHRA definition. “Its actions only dilute the definition and further erode the existing lack of confidence that British Jews have in their sincerity to tackle antisemitism within the Labour movement,” the JLC and BoD concluded. Labour MPs including Ian Austin and Mike Gapes have taken to Twitter to express agreement with the criticism levelled by Jewish groups. Specifically, some Labour activists are concerned by the code’s reference to the need for “antisemitic intent” to be present for a criticism of Israel to be antisemitic. Critics say that this goes against the ‘Macpherson Principle’, according to which an incident is antisemitic if it is perceived to be so by the victim. Party officials say the “evidence of antisemitic intent” point has been misinterpreted as it applies only to criticisms of the Israeli state and controversial discussions. They maintain that the reference to “intent” extends the definition of antisemitic behaviour rather than limiting it because action can be taken even if overtly antisemitic language is not used. The Jewish Labour Movement, the only Jewish group formally affiliated to the Labour Party, wrote to Jennie Formby yesterday and to Labour’s national executive committee today to raise their concerns. Chairs Ivor Caplin and Luciana Berger warned the general secretary that the party would be perceived as “seeking to overturn the long-held view and definition of the Jewish community”. The letter includes the term ‘without prejudice’, which suggests that JLM intends to engage in a dispute with the party. Two JLM representatives, Ivor Caplin and political officer Neil Nerva, met with Formby on Monday and were shown a draft of the new code. It is understood that JLM did not raise objections at that time, and a Labour source therefore says the critical letter came as a surprise. However, JLM says the general secretary should have offered “pre-sight” of the guidelines and the ability “to take them away for further discussion”. LabourList understands that NEC members did not have pre-sight of the new code either. It is thought this is likely due to fears that the document would be leaked, but one opponent of the guidelines said the move “prevented textual analysis”. The new code of conduct can be read in full here. This is the full letter sent by the chairs of the Jewish Labour Movement to the Labour Party’s general secretary Jennie Formby. Thank you again for your time on Monday 3rd July, and indeed, all the time you’ve given JLM over the past few months. The meeting on Monday was not stand-alone. It formed part of a three-year engagement on Labour’s antisemitism crisis which has included your predecessor, the Leader of the Opposition, Deputy Leader and Baroness Chakrabarti amongst NEC members and others, including the recent three-hour meeting with JLM Officers and yourself. There has also been engagement with the Jewish community along the same lines. Throughout all this time, JLM has been clear. The Jewish community, and the Jewish Labour Movement, believe that the best working definition of antisemitism is the full IHRA definition, including its examples. If the full IHRA definition of antisemitism is good enough for the CPS, College of Policing, Jewish community, the Scottish Parliament, the Welsh Assembly, National Union of Students, and Labour Councils across the country, then it should be good enough for the Labour Party. It doesn’t need changing, and it’s unclear for whose benefit these changes have been made. We cannot give antisemites a get out of jail free card. The meeting on Monday was organised at your request without JLM having pre-sight of the documents you presented or being able to take them away for further discussion. There was no formal JLM agreement to any of these documents. Furthermore, we continually argued that to have any confidence in the working group, its recommendations and processes, it required maximum transparency and our participation and membership of the group. Despite offering to play our part, these offers were repeatedly rejected, leaving JLM representatives waiting in your office lobby, and JLM eventually only being allowed to give evidence. It now appears, given the body of the documents you sent, that our evidence was ignored, as we yet again made our position on IHRA clear, among several other points. The perception from the new definition will be that the Labour Party are seeking to overturn the long-held view and definition of the Jewish community. The Party should abandon this definition, without haste, and make clear that it has already adopted and actively using IHRA.